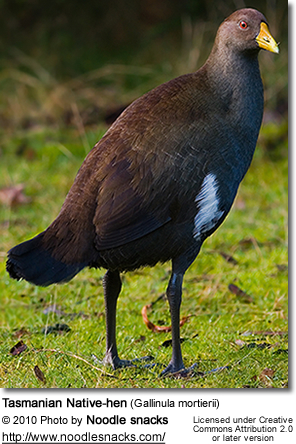 The Tasmanian Native-hen (Gallinula mortierii) is a flightless rail, one of twelve species of birds endemic to the Australian island of Tasmania. 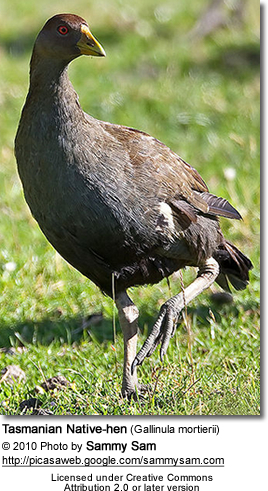 Although many flightless birds have a history of extinction at the hands of man, the Tasmanian Native-hen has actually benefited from the introduction of European style agricultural practices in Tasmania. Other common names include Narkie, Native-hen, Waterhen and Turbo chook. This species was originally described in 1840 as Tribonyx mortierii. The name mortierii is in honour of Barthélemy Charles Joseph Dumortier. 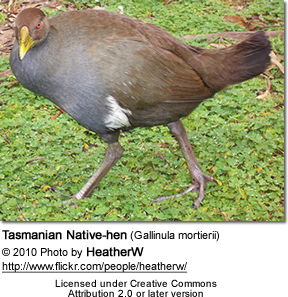 The Tasmanian Native-hen is a stocky flightless bird between 43 and 51 centimetres (17 and 20 in) in length. The upperparts are olive brown with a white patch on the flank. The underparts are darker with a bluish grey tinge. The short tail is close to black and mostly held erect. The legs are thick and powerful, with a grey scaly appearance and sharp claws. The eye is bright red. The bill has a small frontal shield and is a greenish yellow colour. The juvenile bird is similar in appearance to the adult, but the colours are more subdued on the body and the underparts have fine white spots. The bill is greenish yellow and the eyes are bright red. Male birds generally have longer bills and legs, though there is enough overlap that the sexes are indistinguishable, even in the hand (Ridpath:1964). 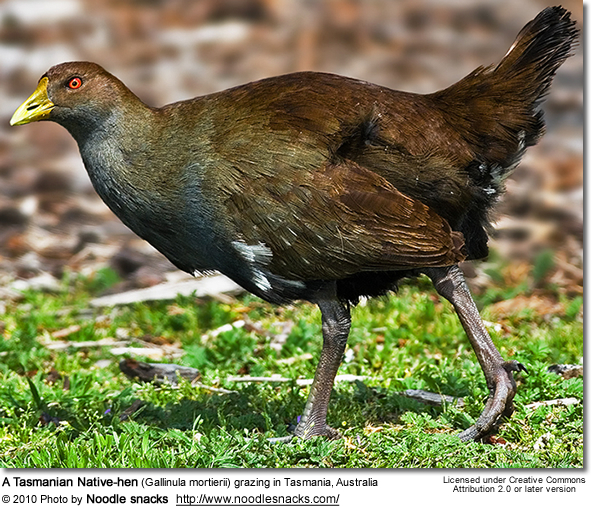 The Tasmanian Native-hen is a sedentary species, living around open grassy areas close to water. It is widespread in Tasmania apart from the west and south west regions. It is not found on King or Flinders Islands in Bass Strait, though Michael Sharland does record it as being on Flinders Island. A population introduced to Maria Island is now well established. It is generally common and easily seen around bodies of water that have grassy verges. Fossil records indicate that the Tasmanian Native-hen was found on the Australian mainland until around 4700 years ago. Suggested reasons for its extinction there have included the introduction of the dingo, or an extremely dry period. 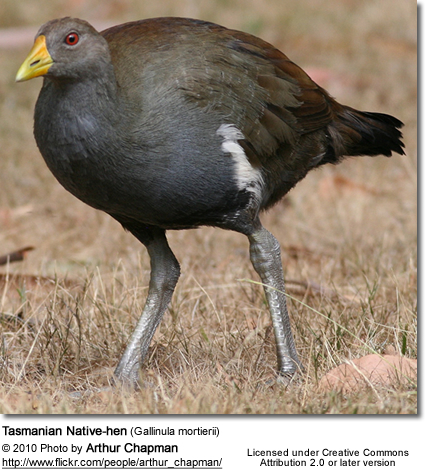 The Tasmanian Native-hen's social organisation has been extensively studied. Tasmanian Native-hens live in groups of between two and five, plus the young birds from the previous breeding season, which tend to stay with the group and contribute to the care of the young until they move off to establish their own territories after approximately one year. The sedentary nature of the species means that groups hold sharply defined territories of up to 5 acres (2.0 ha), and repel transgression into their territory vigorously with calls and displays. Fights can also occur, where birds will jump, peck and kick at each other violently, sometimes drawing blood and pulling feathers. The breeding structure may be monogamous or polygamous, usually polyandrous. Each group contains a single breeding female who will mate with all the males of the group. The unusual social structure based on groups who stay together is not known to occur in many other species; the high ratio of male chicks to female chicks hatched is thought to be a possible explanation for this. The Tasmanian Native-hen has 14 separate calls, ranging from low grunts to high pitched alarm calls as well as a see-sawing duet performed in unison, rising to a crescendo of harsh screeching notes, It also calls at night. Although flightless, it is capable of running quickly and has been recorded running at speeds up to 30 miles per hour (approx. 48 km/h), It uses its wings when running fast to help it to balance. The breeding season begins in the period from July to September, depending upon rainfall and the availability of food. Birds will usually breed once per year, however in good years, with high availability of food, two broods may be produced. The nest is a rough, flattened grass mattress, among taller grasses and is usually built close to water, or on damp ground. With a clutch size of five to eight, the oval eggs measure around 56 by 38 millimetres (2.2 × 1.5 in) and are a dull yellow or buff to brown with some spotting of reddish brown and lavender. As well as the primary nest, nursery nests are constructed with the purpose of roosting with chicks at night and as hiding places in case of predators. Chicks are covered in a dark brown fluffy down. The diet of the Tasmanian Native-hen is mostly made up of grass shoots and the leaves of low herbs which it grazes during daylight hours. Birds will also eat insects, seeds and orchard fruit. The species has a reputation among farmers as an agricultural pest. The damage to agriculture was extensively studied in the 1960s by M Ridpath and G Meldrum, who found that although there is some damage to crops, rabbits were responsible for more damage. Many beliefs held by farmers about damage to crops were found to be unlikely, with damage probably caused by other species. The Tasmanian Native-hen is a secondary grazer, meaning that it depends on other species to keep grass swards low and with fresh shoots. Before European settlement in Tasmania, the cleared spaces required for feeding would probably have been provided by Indigenous burning of grasslands to provide feeding grounds for mammals, which would be hunted for food. The expansion of these cleared grassy areas, and the introduction of rabbits, has provided greater food sources and consequently greater numbers of the species within its range. 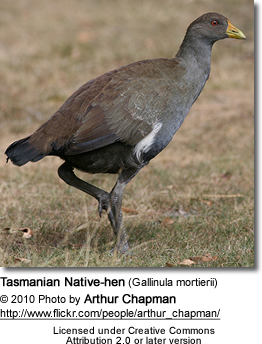 The Tasmanian Native-hen is currently classified as a species of least concern by the IUCN. Although there is a healthy population size and no significant falls have been measured, there is concern about the recent introduction of the red fox to Tasmania and the possible impact that it will have on this and other species. 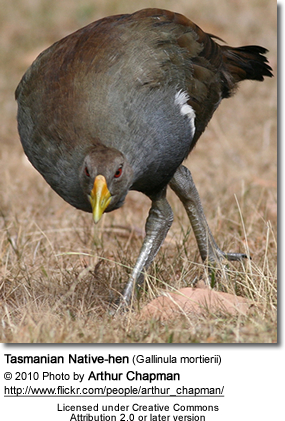 As of 15 August 2007 the Tasmanian Native-hen was listed as protected under Tasmanian legislation. Prior to this the Tasmanian Native-hen was one of only four native birds that had no legal protection outside national parks and other reserves in the state of Tasmania - the last of Tasmania's 12 endemic bird species with this dubious status. The three remaining unprotected native species are the Forest Raven, the Great Cormorant and the Little Pied Cormorant. All other native Tasmanian birds are listed as protected under the state's Nature Conservation Act 2002. Ridpath, M.G. ; P.J. Higgins (1964). 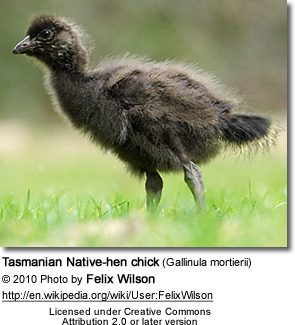 The Tasmanian Native Hen. Hobart: CSIRO, Division of Wildlife Research.Tasmanian Native Hen. University of Tasmania. Accessed 22-5-2009 Marchant, S; P.J. Higgins (1993). Handbook of Australian and, New Zealand and Antarctic Birds. Volume 2: Raptors to Lapwings. Melbourne: Oxford University Press.Watts, dave (1999). Field guide to Tasmanian Birds. Frenchs Forest, New South Wales: New Holland Press. pp. 70. ISBN 1-876334-60-6.Ripley, Sidney Dillon; P.J. Higgins (1977). Rails of the World. David R. Godine Publisher.Thomas (1979).Sharland (1958).Marchant and Higgins (1993).Ford, Hugh A. (1989). Ecology of Birds: An Australian perspective. Chipping Norton, New South Wales: Surrey Beattie and Sons. ISBN 0949324191.Ridpath (1964).Marchant and Higgins (1993).Sharland (1958); Ridpath (1964).Beruldsen, G (2003). 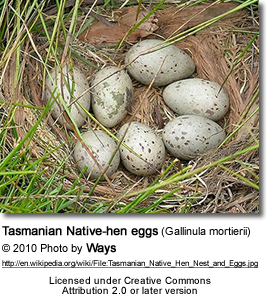 Australian Birds: Their Nests and Eggs. Kenmore Hills, Qld: self. pp. 210. ISBN 0-646-42798-9.Ridpath and Meldrum (1968).IUCN (2006). 2006 IUCN Red List of Threatened Species Downloaded on 20 April 2007. Ridpath, M.G. and Meldrum G.K. 1968. Damage done to pastures by the Tasmanian Native hen, Tribonyx mortierii, in CSIRO Wildlife Research, 1968, 13, 11-24. Sharland, M. 1958. Tasmanian Birds: a field guide to the birds inhabiting Tasmania and adjacent islands, including the sea birds. Sydney: Angus and Robertson. Thomas, D. 1979. Tasmanian Bird Atlas. Hobart: University of Tasmania.